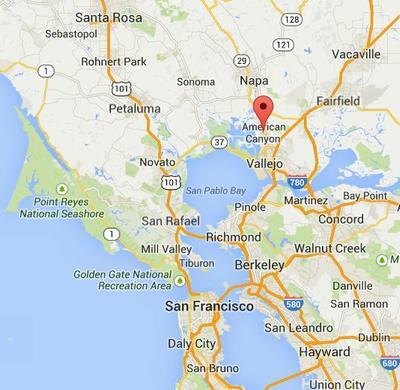 SACRAMENTO, California, August 24, 2014 (ENS) – At 3:20 am Sunday, a magnitude 6.0 earthquake struck the small city of American Canyon in California’s wine-growing Napa County, 35 miles northeast of San Francisco. 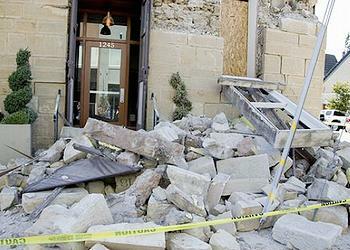 The quake caused power outages and damaged roads, homes and businesses. No fatalities were reported. It was the largest Bay Area quake since the 1989 Loma Prieta quake, which measured about 6.9, according to the U.S. Geological Survey. The earthquake is located at the eastern shore of San Pablo Bay within a set of major faults of the San Andreas Fault system, according to the U.S. Geological Survey. California Governor Jerry Brown declared a State of Emergency and the Governor’s Office of Emergency Services, Cal OES, is coordinating the disaster response together with local, state, and federal response organizations. “My Office of Emergency Services has been on full activation since early this morning and is working closely with state and local emergency managers, first responders and transportation officials to respond to impacts to residents and critical infrastructure,” said the governor, asking people in affected areas to follow their guidance and instruction. The state has deployed three Urban Search and Rescue Teams to help with the response and recovery efforts. The American Red Cross has opened an evacuation shelter for affected residents at Crosswalk Community Church at 2590 1st Street in Napa. According to the California Natural Resources Agency there are no reports of damage or releases at Bay Area Refineries and Marine Oil Terminals. The most severe quake to rattle the Bay Area in nearly 25 years injured dozens of people, started fires and damaged homes and historic buildings. The worst damage appeared to be at the Napa Valley Mobile Home Park in the town of Napa, where four homes were destroyed by fire and eight more were damaged, Napa County Fire Capt. Steve Becker told reporters. The area utility, Pacific Gas and Electric, PG&E, experienced a peak electrical outage to approximately 70,000 customers. The company has already restored service to some 53,000 customers, most in Sonoma County. In the more heavily impacted Napa County, PG&E expects to restore service today to the majority of the remaining 17,000 customers whose homes or businesss are not damaged and can accept restoration. The company expects that some outages may require additional time to restore and will be communicating directly with customers whose repairs may take longer. Outage updates are available at pge.com/outagemap. There are currently 20 earthquake-related gas-distribution outages. The company has received several hundred gas odor calls from customers and is in the process of visiting each of these premises throughout the day to investigate each odor call. The company will make any individual leaks safe and will perform repairs throughout the day and beyond until all are completed. The company has completed an initial patrol of its gas transmission pipeline and has not identified any damage. It is currently conducting a second patrol. In addition, the company is proactively doing leak surveys throughout the affected areas in order to identify and address any gas leaks. The earthquake lies within a fault system that forms the boundary 44 mile (70 kilometers) wide boundary between the Pacific and North American tectonic plates, according to the USGS. The earthquake occurred near the well-known West Napa Fault, and the less well known Carneros-Franklin Faults, which juxtapose different suites of rocks. Although there are several faults in the region of the earthquake, only the West Napa Fault is known to have displaced Holocene-age sediment, which is positive evidence of surface fault rupture in the last 11,000 years. Historically, regional shaking sufficient to seriously damage structures at Mare Island occurred during the magnitude 6.8 Hayward Fault earthquake in 1868, the magnitude 7.8 San Andreas Fault earthquake in 1906, and particularly during the magnitude 6.3 Mare Island earthquake in 1898. The 1898 earthquake may have occurred about 12 miles, (20 kilometers) to the northwest on the southern Rodgers Creek Fault. The epicentral region of this earthquake is shown on USGS National Seismic Hazard Maps to have a high probability of strong shaking in the future. “Even larger nearby events than the 1898 earthquake can be expected in the future,” the USGS warned today.